This post was written by Kathryn Bleakney. Kathryn is doing an MRes in Sports Science specifically researching Physical Activity, Sedentary Time and Mental Wellbeing of 1stYear UofG Postgraduate Research Students. Findings from her research show that UofG PGR students are highly sedentary and there is a real need for all of us to be more active and reduce sedentary time. Researchers are continuously reminded of academic duties and priorities. But what about your physical and mental health? Prioritising your health is one of the greatest investments you can make in your research and for your long-term future. Keeping active and reducing sedentary time is one key way to improve both physical and mental health and wellbeing. There are so many benefits including reduced risk of depression, anxiety and mental health issues, sleep improvement, weight maintenance, stress management, improved work-life balance and quality of life. This all has a positive impact on your research by increasing productivity and improving alertness. Not to mention additional common benefits of physical activities – meeting new people, seeing new places, learning new skills and a sense of achievement outside of academia. So, what exactly do the terms physical activity and sedentary time mean? Physical Activity – any movement of the body which uses energy. Moderate (e.g. walking to/from your office, the UofG Daily Mile, PGR walk, gardening, household chores, dancing) and vigorous (e.g. running, climbing stairs, cardio classes at the Stevenson Gym) physical activity are most beneficial for our health. Check out the WHO’s site for more examples. Current guidelines recommend 150 minutes per week of moderate intensity physical activity OR 75 minutes per week of vigorous intensity physical activity OR a combination of both. Leave your desk for coffee/lunch breaks. 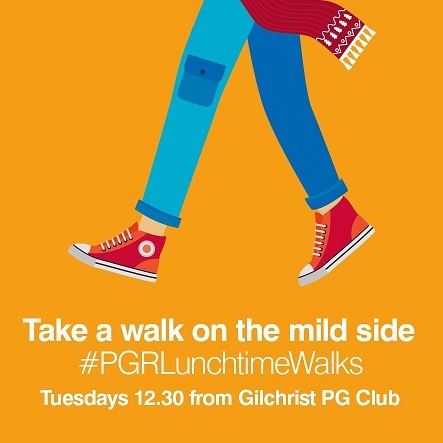 Why not try the PG Gilchrist Café or Byres Road? We’re lucky too that Glasgow provides so many opportunities to be active both on and off campus. GUSA buddy system: if you’re not comfortable exercising by yourself why not try the GUSA buddy system? You will be paired with a ‘buddy’ for 4 weeks, and you don’t need to be a member of the gym. Why not try a Park Run? These free, weekly, 5km timed runs are friendly and sociable events, suitable for all abilities. All you need to do is register before your very first parkrun. Good Move Glasgow: Glasgow holds over 50 free walks each week, including free themed walks. These are good opportunities to enjoy the fresh air, meet new people and discover the sights, culture, arts, architecture, wildlife and history of Glasgow. Kelvingrove Bowls (Free, Summer Only): A firm favourite amongst my friendship group! Pop along to the bowling greens by the Kelvingrove Museum and the Glasgow Life staff will sort you out and explain exactly how to bowl properly – although some of us are still trying to learn!! Which of these activities are you inspired to have a go at? Let @UofG_PGRblog know how you stay active and maintain that important work-life balance!